Access Type: neckline access: pull aside the top neckline to access the inner layer and lift it to access breast. A Diva Alba nursing dress for breastfeeding is fabricated from a high-quality modal/cotton fabric with a small touch of spandex. It can be worn with any style and any time: during pregnancy, during breastfeeding and afterwards! Modal is a type of rayon with improved features, modal fabric is very soft and is often blended with cotton and spandex. It is cool to the touch and very absorbent, takes and holds dyes easily. Modal is less resistant to shrinkage than cotton and pills less as a result of friction. These qualities make modal ideal for use in nursing wear as it is very comfortable in wear, resistant to frequent use and adjusts well to your changing body. Based on many babywearer's feedback, the neckline access is the most suitable for breastfeeding in a sling. 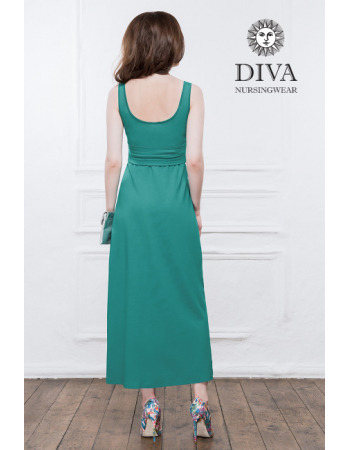 So we are sure that Diva nursing dresses will suit perfectly your Diva slings! Machine wash warm (max. at 40 degrees), gentle with like colours.